With our range of Fumagalli Classic Lantern Posts, we are giving you the opportunity to choose your perfect lantern or globe post. Simply click here to download our spec sheet and follow the steps shown below. The blue text below shows an example to help in creating the part code for your custom post. Please be sure to use the sizing guide on this spec sheet to match together the correct items. All items are categorised into SMALL, MEDIUM, LARGE or GRAND. 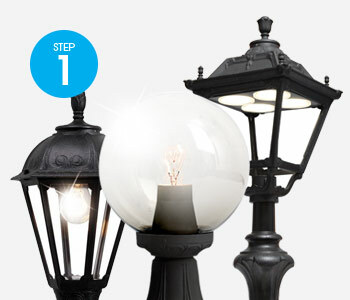 The first step is to choose a Classic Lantern or Globe. There are seven fantastic Classic Lantern ranges for you to choose from, including Tobia, Anna and Golia, or alternatively choose from the three ranges of Classic Globe. 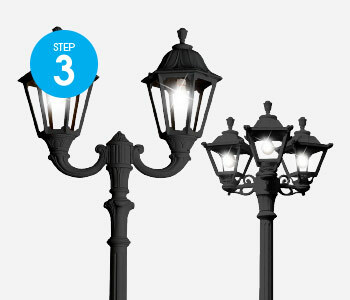 The globe or lantern that you select will give you the first 3 characters of your code, For our example we have chosen the Tobia Lantern so the first part of the code is Q33. Next up, how tall do you want your post to be? Choose from our Classic Post Collection shown on 2nd page of the spec sheet. 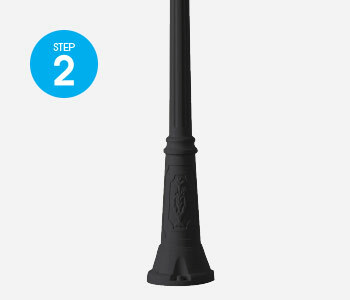 Our Fumagalli lamp posts are unique in that they are manufactured using exclusive Fumatech technology, which gives them the same strength as a metal post but with all the advantages of rust and corrosion resistance that only a resin material can offer. The post that you select will give you the next 3 characters of your code, for our example we have chosen the 3500mm Horeb post, so the next part of the code is 208. 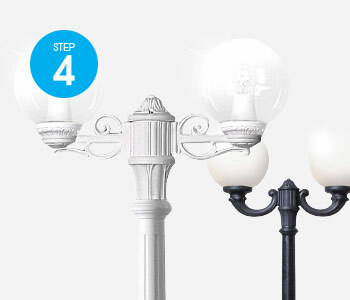 Do you need 2, 3 or even 4 lights on your post? If so, the next step is to select a Classic Post Top System. We have three ranges available; the Bisso collection (to suit small & medium category), the Ofir collection (to suit medium & large category), and the Adam collection (to suit large & grand category). If you do require this step, it will supply the third section of your code. For our example we have chosen the Adam System 3 with the code M30. Black fittings are stocked as standard; however other colour finishes may be available to you on special order. The lens can be either Clear (Code X) or Opal (Code Y). The code for the fitting colour will appear first, for our example the fitting will be Black (Code A), and then the lens colour will be Opal. The code for this section is then joined as one: AY – this is the fourth part of the code. 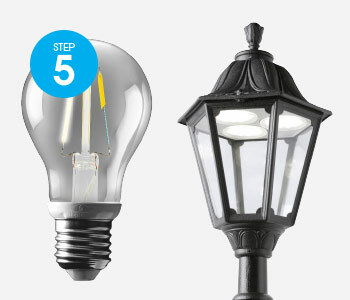 Lastly, it’s time to choose which lamp type will be in your lantern/globe. You can select whether you would prefer E27 Fitting or Dedicated LED fittings (which is only available for some of the larger fittings e.g. Tobia, Noemi & Elia). If you choose E27 fitting, be sure to choose a Fumagalli Filament lamp to go in your fitting. CHOSEN YOUR POST BUT NEED HELP WITH THE CODE? Feel free to get in touch today! You can also view our suggested post combinations by clicking here.